[google6a7b7d93c7100df5.html] Sunshine's Creations.Vintage Threads Inc.com: Who wants yoyo afghan pattern? A few people have emailed and left comments about my yoyo afghan. I am wondering how many people are interested in a post with instructions and pattern. If enough people are interested (like over 50 I will not count duplicate posts by the same person as anything more than 1) I will try to make a tutorial up other wise I will continue to work on packing up my home. Of course you wouldn't have to do as many rows as me or even the same size thread. Yarn could even be your choice, just use the right hook for the size of yarn you use. Also yarn would work up much quicker but still have the same type of feel. Once you know the technique you can use it to make scarfs, baby blankets, edgings and what ever your mind thinks up. Well, I wasn't going to ask, since I know you're busy packing and whatnot, but since you brought it up...I would LOVE some instruction! I've been staring at these pictures for a few days now, and I just can't figure out how to do it, lol. Whenever you have the time, I would love a set of instructions. I'd love the pattern as well. I also would like to see more pic's of it laid out and all. I'd love some instructions!! They are BEAUTIFUL!! I found this through your post to the grannysquares flickr group. I would love to have a pattern for beautiful afghan, but absolutely you should take care of the other stuff first! OOOOOOO, PLEASE share your directions! I'm just learning to crochet and this looks like something I could handlel. I could even use it to make a prayer shawl. I just love the colors you chose! oooohhhh, yes, please, i would like to have the pattern too. I would love to see a tutorial for this beautiful quilt. I hope all is going well for you! As with everyone else so far, I would appreciate a pattern, as well as pictures of the full afghan laid out. Thank you! Beautiful! Another vote here for the tutorial! thanks. Wow! Beautiful colors and such talent! This must have taken some time to do. You are so generous to offer a tutorial. I would love the pattern too. Thank you so much in advance! I want a tutorial, pleez. Very cool, I love those forever projects,(they do eventually end up king size don't they? lol) I would love to see a tutorial, thank you! I have just started making fabric yo-yo. Now a yarn yo-yo would be very cool. I too have been trying to figure out if they are single yo-yos or a continuous row. your yoyo afghans are beautiful and I would love a tutorial please! This looks so fun! Please do a tutorial! I would love a tutorial. I think they are beautiful. I love your blog and read it regularly. I would love the instructions. This is a fabulous idea! I too would love a set of instructions. Thank you for offering to write them up for everyone. I love the pattern, the afghan looks beautiful. I would love the instructions. a tutorial would be really awesome!! You're so sweet to offer this...would absolutely love to know how to do this! I'd love to know how to do this - have only recently started doing crochet. Such lovely colours. What an awesome blanket. I really would appreciate to get this pattern. By the way I came across to your site by searching for an hexagon tuto. Luckily I have found your great one and so I will give them a try. Hi, I would love to see a tutorial, this afghan is gorgeous! I want to learn how to crochet one of these, this stitch looks awesome! I would love a tutorial/pattern! But I understand you are very busy. I love yoyos. I am lucky enough to hava a local window treatment store save me all their discontinued fabric sample books (yoyo heaven!). I have never seen a crocheted yoyo project and would love the directions. Thank you for sharing your fun, colorful blog. ABSOLUTELY!! This is a great pattern and would love to learn how to make it. oh wow, please, it would be amazing if you were to do a tutorial on this. I'm actually just beginning crochet but still, i wanna learn this one soo badly... its very unique. I've never seen anything lyk it!!! thank you soo much... wow, number 35!!! 15 more to go!!!!!!!! Yes! 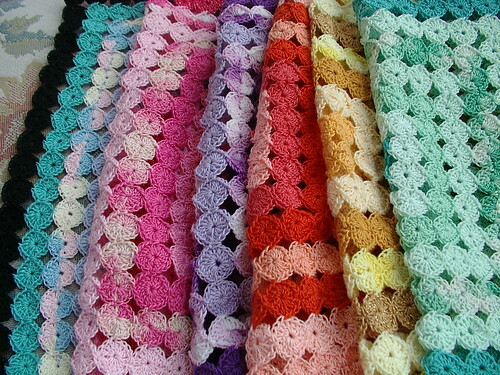 please post the pattern for this wonderful afghan! Oh yes, this is a beautiful pattern....would LOVE to have a tutorial written up! I bought the book & just wanted to tell you the technique is very clever! I detest sewing so I love the attach-as-you-go aspect. Right now I'm making stashbusting flowers in various colors (center yoyo with 6 around it) using this technique that I will join with white once I have enough to make a blanket. It's going to be very cool!